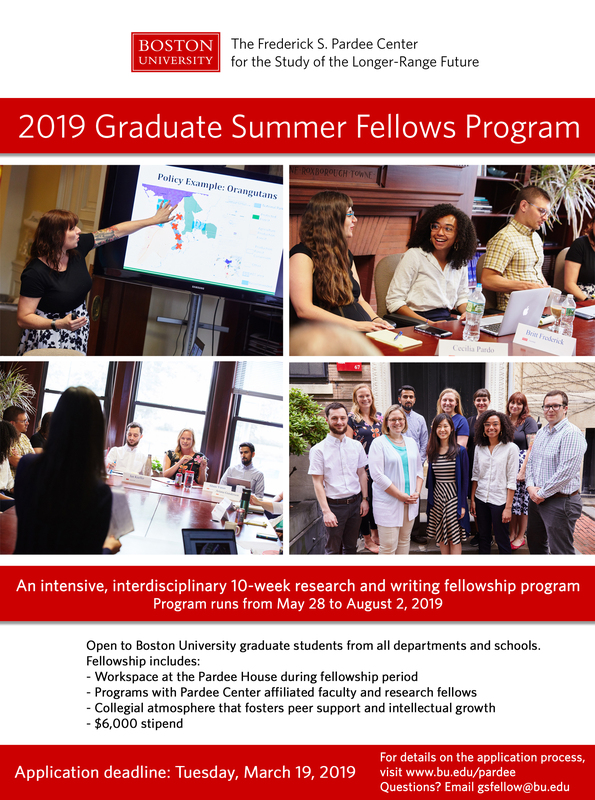 Applications are now being accepted for the 2019 Pardee Center Graduate Summer Fellows Program, which offers graduate students from across Boston University an opportunity for intensive interdisciplinary research and writing on topics aligned with the broad research interests of BU’s Frederick S. Pardee Center for the Study of the Longer-Range Future. The Pardee Center conducts interdisciplinary, policy relevant and future-oriented research that can contribute to long-term improvements in the human condition. The Center is especially interested in rigorous analysis relating to longer-range human development. We especially encourage proposals for research that has the potential to identify actions that can be taken today to make our collective global tomorrow better. The 10-week fellowship (May 28 – August 2, 2019) includes a financial stipend of $6,000, structured interaction with Pardee Center affiliated faculty and research fellows, and a collegial atmosphere that fosters peer support and intellectual growth. Summer Fellows occupy workspace provided at the Pardee House while they conduct independent research, and produce a substantive research paper that may be considered for publication by the Pardee Center. Fellows are expected to work at the Pardee House each Monday through Friday for the duration of the Fellowship and to participate fully in Pardee Center activities and all Summer Fellows’ events. The Graduate Summer Fellowships are open to all Boston University graduate students. First-year master’s and early to mid-stage doctoral students, including ABDs, are especially encouraged to apply. (Students completing degrees in May 2019 are not eligible.) Research proposals that link positively to the student’s own and/or BU faculty’s ongoing research are especially desirable. Proposals for any topic related to the Pardee Center’s longer-range global human development research mission will be considered, especially including (but not limited to) those relating to (a) large-scale global environmental change, especially related to the intersection of climate change and land use, and associated challenges for sustainable development, (b) policy issues involving “trade offs” in relation to economic development and water management, food security, and/or energy security in developing countries, (c) how governance and policies of international institutions that finance development are evolving in relation to large-scale environmental challenges, (d) the intersection of technological, financial, social, and political systems that support the development of sustainable energy systems in rapidly expanding urban areas in developing countries, and (e) access to and delivery of health services in developing countries, especially in relation to non-communicable and emerging infectious diseases. Successful proposals will clearly convey how the research is related to improving quality of life; clearly articulate how the research is relevant to the longer-range future; and explain why and how it can be completed in a 10-week period. Applications are especially encouraged from fields such as global public health, engineering, the humanities, and natural sciences. The deadline for applications is close of business on Tuesday, March 19, 2019, and candidates will be notified of the outcomes by late April. Detailed application instructions are available here. Questions regarding the Summer Fellowship Program may be directed to gsfellow@bu.edu. A list of frequently asked questions can be found here.